So a new baby has just exploded into the world... yay! Good times all round and more realistically, good expensive times! It is no secret that new babies can break the bank what with necessities of nappies to car seats and not to forget all the toys! 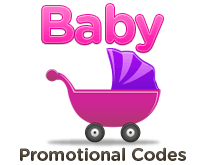 To help you get all the greatest baby products at low reasonable prices, we have put together some great baby promotional codes for your viewing pleasure! So you can use and abuse when shopping online to enjoy discounts and indulge in money saving incentives. Babies are exciting and fun so there is no need to kill the buzz by paying above and beyond on products... especially when you have a discount code for your favourite online baby store in your back pocket!